We have found this glue to be the very best for using with wood and bamboo veneer for skateboards and other bent wood projects. for our Pre-Shaped Veneer Sets, one gallon will be enough to make: 13 Street Decks, OR 11 pintail Long Boards (7 layers), OR 30 Lil'Rockits. For builders using uncut (rectangles) of veneer, please adjust your requirements accordingly. Note that if you are using a fresh roller, a fair amount of glue will be absorbed into the roller. Plan accordingly! Following the instructions in your kit, or from our tutorials use the glue amounts recommended for the size of veneer sheets you have. Use the roller supplied with your complete kit, or for custom builds, use a 9” close-nap paint roller. 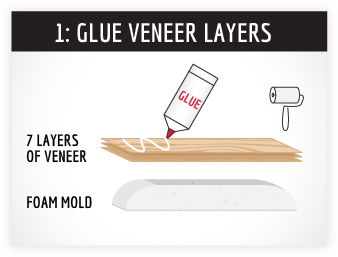 Roller out a thick but not pooling layer of glue on one side of the facing veneers and if you have time (or a helper), apply a thinner coat to wet the facing sheet. 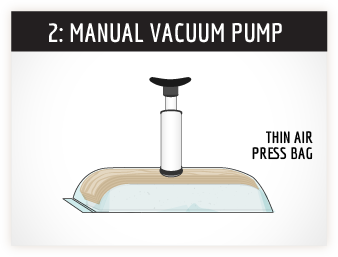 Make sure that no glue has dried before you stack the veneers and get them pressed in the Thin Air Press vacuum bag. Dried glue will not make a bond. 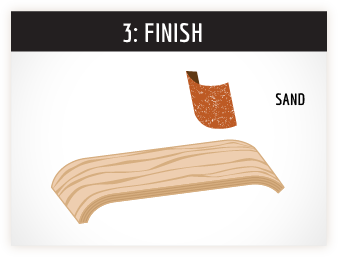 The working time is much longer (9 minutes) with this glue than other woodworking glues however if any of the glue dries before the stack is pressed in the TAP, those dry spots will result in de-lamination. When you are done with your glue up, do not wash out the roller, but store it in a plastic bag. Keep using the charged roller until it literally falls apart. Q: How much is enough glue? A: As per the instructions, a thick but not pooling layer of glue on one side and a thinner amount to wet the other side will be perfect. Too much glue and you get bubbles in the veneer, and too little you will starve the joint and get delamination. Q: Why use Titebond III and not II? Q: It says on the bottle that the glue dries in 30 minutes, so why do I have to keep my board in the TAP bag for 8 hours? A: Titebond III will start to set up in 30 minutes, but most users of this glue are not bending 7 or more layers of 1/16” thick veneer over a mold into a skateboard! The label also says not to stress the joints for 24 hours, so our 8 hours minimum dry time in the vacuum press will allow enough of the glue to dry that it will keep the layers in shape. Q: What about using SK8 glue? A: SK8 is another glue made also by Franklin for the small industrial skateboard industry. SK8 has a 3 month shelf life, after which it gells and is not usable. (we found out the hard way). Rumor has it, that Franklin used the SK8 formulation to create a more shelf-stable glue, and that became Titebond III. A little reverse engineering from the skateboard world! Q: Will dried Titebond III wash out of my favorite t-shirt? A: Nope! That’s why we have Roarockit aprons, as it never fails that glue ends up on your clothes while doing a glue up.